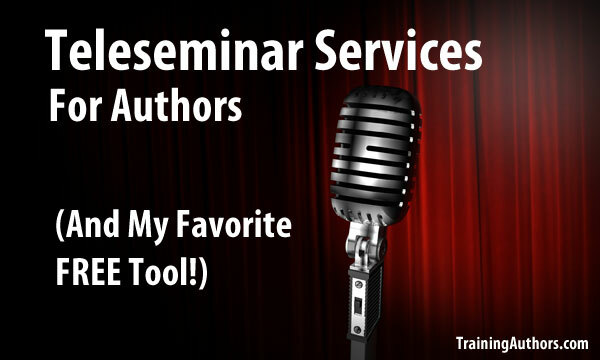 Teleseminar Services for Authors and My Favorite FREE Tool! Which teleseminar services do I recommend for authors? And how can authors use teleseminars? That is what I cover in this post. I have also shared a video training which includes a step-by-step tutorial of how to use my favorite free teleseminar tool! Sell more books. By presenting a presentation over the phone, you offer much more interactivity and a stronger personal connection than you can through a website, guest blog post or direct mail piece. Create products. The calls themselves can be turned into products or classes. You can sell access to your live events, or you can record them and sell them later as CDs or audio downloads. And that’s just for starters. Get to know your audience. Being able to interact with your audience in real time allows an unprecedented level of market research, right in the moment. Establish yourself. If you interview experts in your area, you will quickly be seen as an expert by association. Build your list. Teleseminars are popular ways to introduce yourself to a new market. It’s easy to invite people to your free events — and as they sign up, they become part of your list. Create trust. Trust is crucial when you want to do business online. And one of the best ways to build trust with your audience is to interact with them directly. As they hear your voice live on the call — and as they ask questions and get answers right then and there — you become “real” to them and they’ll be able to bond with you. This is something that’s much harder to accomplish through sales letters and emails. There are also paid services available, including the one that I recommend: Instant Teleseminar. They give you a 21 day $1 trial to try out their services. This is pretty much a done-for-you service and is highly recommended. I looked at almost all the free teleseminar tools and Free Conferencing so far this has been my favorite FREE tool. It has a lot of features like an online web controls, ability for Q&A, you can broadcast previously recorded audio files (great for guests with limited time slots available), you can use their optional screencast feature, you can break up participants into “discussion room”, free recordings you can download or make available for playback, chat function and much more. If you are interested in teleseminar services definitely check it out. You can have up to 1000 participants and a 6 hour maximum time per call. In this video tutorial, I share why authors should consider using teleseminars. Skip ahead to the 8 minute mark to get my step-by-step tutorial where I show you on my screen on how to use FreeConferencing.com for your next teleseminar. Free Conferencing is by far my favorite FREE teleseminar tool. Post your comments, questions and your own experience with teleseminar services in the comments below. Did you find this tutorial helpful? If so, please share it with your friends! Shelley Hitz is an award-winning author and the owner of TrainingAuthors.com and Author Audience Academy. She is passionate about helping authors succeed in publishing and marketing their books. She teaches from personal experience. Shelley has been writing and publishing books since 2008 and has published over 40 books including print, eBook and audiobook formats. Love What You Read? Check This Out! Get a FREE author training ($27 value) when you sign up for our newsletter. Hey guys, thanks for this great info! I am looking at doing a series of pre-recorded seminars to include as a bonus with my eBook. Buy the book and you get access to the seminar training free. Any suggestions for something like this? Sounds like a great idea! My post “Teleseminar Basics for Authors” that will be published on 9/20/13 should give you a lot of other tips for your series. Be looking for it! Good to hear you like Free Conferencing. I haven’t jumped into giving presentations yet, but that was a platform I’d considered. It will also be interesting to see how the new YouTube Live idea works out in the future. Yes, I’ve used FreeConferencing.com several times for teleseminars and do recommend it. For webinars, we are transitioning to Google+ Live presentations so once we learn the process we will make sure to share a post about it as well. You’re welcome! Glad you found the info helpful as well as the free service I recommended and have used myself, FreeConferencing.com. Thank you – I’m planning a teleseminar so your info came in quite handy! Thanks for sharing this piece.. Teleseminar is just coming up here in this part…I will av an edge if I quickly implement things.